I wasn’t unhappy, but I wasn’t happy either. Don’t get me wrong, my firm was great, and I genuinely enjoyed being a solicitor (and still do). But as a lone parent, working full time, my going to the office every day was becoming a bit of a slog. Working part time wasn’t a financially viable option for me. However, I still wanted to take my daughter to school, go to every assembly and have her friends round for tea. I wanted some more time for me, perhaps to enjoy that costly gym membership or be able to go for a run in the daylight. In short, I wanted to cut myself some slack, without compromising my career. When Stuart Gillespie first approached me to work with him in setting up a law firm, all I could see were the downsides. I was concerned about not having a guaranteed income and feared removing the comfort blanket of my existing role. Questions about where I would get my work from, who would instruct me, and could I build a sufficient client base to earn a living, also immediately sprung to mind. However, I’ve never wanted to look back on my career and regret not having done things my way when I had the chance. I aspired to create a new environment, where I could do the work I am passionate about whilst regaining some sort of work life balance. I wanted a law firm where everyone could manage their own time in a way that suited their lives. I wanted to create a place where solicitors could work to live and not live to work (excuse the cliché). I felt sure that having a passion for the legal industry shouldn’t mean being sat at a desk in an office all day, every day. We both wanted to build a firm that would give solicitors their lives back, and enable them to make their practice work for them. And so it was, with those aspirations and Stuart’s progressive entrepreneurial flair, that Cognitive Law was born in September 2014. Cognitive Law was founded to allow solicitors to be their own boss, to manage their own time, their clients and their work load. It’s all not been plain sailing and I have probably never worked so hard. But now the difference is that I work when, where, and how I like. I can choose whether to work from home because someone is coming to fix the boiler, or whether to go into the office. No one bats an eyelid when I do the daily school run and consequently don’t arrive at my desk until 9.30. If I’ve got up early and done a few hard hours work, I’m perfectly at liberty to down tools for the day. I’ve even been known to go to the gym. Last month I had a meeting at a city law firm. As I arrived my coat was taken by one of two reception staff, and I was directed to the boardroom. Tea, coffee, water, fruit and biscuits were laid out, and the room was bright and modern. On the floors below the boardroom were dozens of hard working industrious lawyers. As I sat there I looked around and pondered whether I missed working in a traditional law firm. I don’t miss the commute; leaving home early to drive through the rush hour traffic. I don’t miss being unable to do the school drop off and pick up. I wanted to be an inspirational mother with a successful career and woman my daughter would look up to – but I also wanted to be with her, and spend quality time with her. I don’t miss being ships that pass in the night with my partner (also a solicitor). I’m not a lone parent anymore, but that doesn’t mean I don’t want to spend time at home. I don’t miss the billable hourly targets. The pressure of reaching your target each month, and the feeling of failure if you didn’t. Having to justify what I had done each and every working day, each month. I always knew that I was motivated to work hard, I just railed against having to itemise my time for scrutiny. Obviously consultants still have targets, but they set them. They’re realistic, achievable and cover their overheads rather than everyone else’s. I don’t miss the internal meetings. Meetings for the sake of having meetings; meetings about what actions you needed to do before the next meeting. Meetings about what actions you hadn’t done since the last one. If only I could have billed all the hours I spent in meetings! I don’t miss office politics. Most of us are familiar with committee meetings about decisions that could be made by one person in two minutes; the challenges of hierarchies (and patriarchies); and who should be allowed to attend this or that event. I no longer have to negotiate, haggle over or barter for the prime holiday leave in August. This is all behind me now. By offering our consultants up to 70% of their billed and paid fees, Stuart & I have created an environment in which solicitors want to, and do, work as hard as they like – but on their own terms. Backend support is always available to them from administration and marketing to invoicing, paralegal assistance and a case management system they can use on their phone. Nothing is ever perfect, but I am confident that we have created a model that ensures our solicitors have everything they need to do the best they can for their clients without compromising themselves. And we have now introduced a hybrid remuneration model that provides a salaried stepping stone to full self-employment for solicitors who want to ease themselves into consultancy gently. 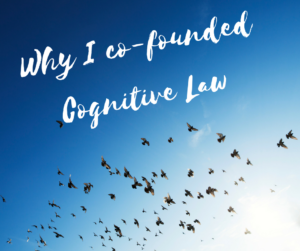 We are now into our fourth year and do I regret my decision to co-found Cognitive Law? Absolutely not. I love what I do and the way I have chosen to do it. After I left that meeting in the nice big law firm I went to meet someone for a long lunch, then I worked in a café on my laptop. And I was still home in time to do the school run. If you think that this might be the legal life for you, please do not hesitate to get in touch.